e-Learning Acupuncture: Conversation starters with your students online? Are you an online teacher in a sociology or psychology class? Do you sometimes scour the web for multimedia tidbits that you can use with your students to start a discussion? I think many teachers online are searching for those lovely tidbits that are inspirational, interesting and moving so as to spark learning and ultimately to fuel communication and discussion between students online. "StoryCorps is an independent nonprofit whose mission is to provide Americans of all backgrounds and beliefs with the opportunity to record, share, and preserve the stories of our lives." I learned a long time ago that truth is often stranger than fiction so real life accounts of people’s lives can be a great spark for discussions in any humanities field. 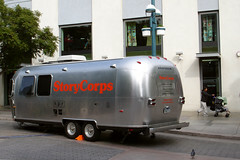 StoryCorps has conducted over 30,000 interviews many of which are available in audio files on their website. They are short stories which makes them digestible easily. Many are VERY interesting. One of the latest ventures by StoryCorp is to create animated shorts from a small selection of their stories. Directed by Mike and Tim Raush, the first five shorts are fantastic. Check them all out! Humanities teachers will have a field day with these animated shorts. I am sure. Enjoy. If you have an interesting way to integrate an animated short video into your online class, leave a comment below and let us know your tips and tricks!